This is a long-form take on Young Critics Lab, the annual workshop on film criticism for youngsters organized by MAMI which is the organization behind the Mumbai Film Festival. 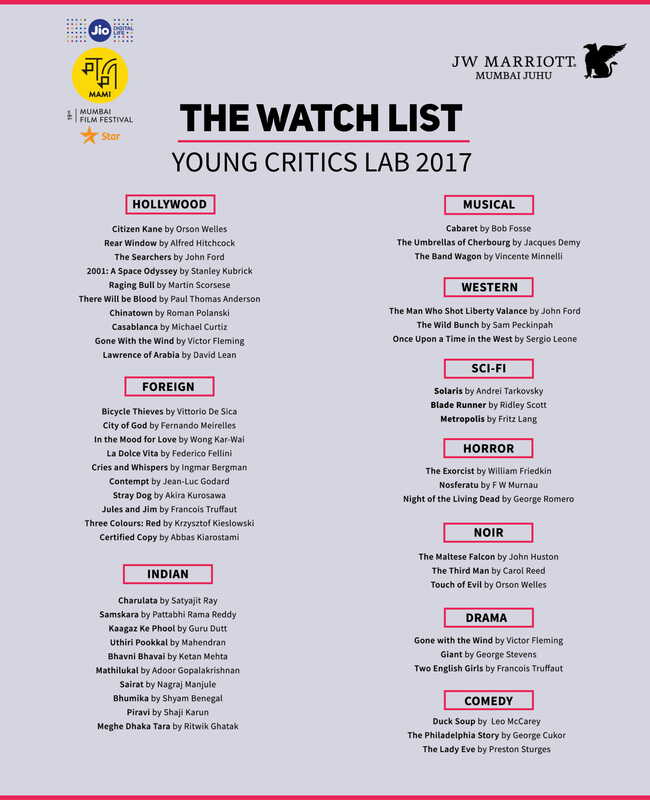 I attended all the three rounds of the lab in 2017 between August and October, which typically ends with the finalists attending the week-long festival in various venues across Mumbai and selecting a film for the Young Critics Choice Award. A guy I only know as Yash won the Best Young Critic Award that year, with the lab again having a successful bout in 2018. I’m a bit late with this editorial but I think that guy from Kerala who pinged me on Twitter back in July with some questions about the lab would find this helpful. I hope he (and countless others) make it to the lab in the future years because it’s one hell of an experience. I have been a fan of cinema for the better part of my adult life. As a young boy, I was least interested in any form of art. I didn’t read books nor was I exposed to any kind of screen-based entertainment. That’s because I was brought up in an environment that didn’t encourage much blending with the arts. Poverty may have something to do with it, but that was a long time ago. As a child, I remember going to one or two circus shows that I immediately grew to despise. And the fondest memory I have of watching a film on the big screen was when we went for Jijo Punnoose’s 1998 fantasy drama, Chhota Chetan, which is also known as India’s first 3D film. I don’t remember the specifics or even the details of the plot because I haven’t seen it again after that day, but the idea of sitting in a dark room with people having similar interests, wearing a contraption over my eyes, and watching motion picture unfold in front of me taking me beyond reality really stayed with me. Although it took me some time to actively pursue this interest, I wanted to do more than just watch and analyze films in my head. My interests in cinema then grew exponentially in 2012 when I created an account on IMDb and started reviewing films in my free time. Rating films (out of 10 stars) and reviewing them on the platform gave me an instant rush, but I soon began to realize that instead of appreciating them, I was ranting, finding faults, and spreading negative opinions. And fellow IMDb users seemed to love it. Today, some of my most popular (or useful) reviews on IMDb are those where I have given the films a negative rating (mostly one or two stars). I had no formal education in the arts or any experience in the department of filmmaking, which showed in my reviews. I was calling films good, average, and bad without even analyzing their aesthetic, technical, or artistic qualities. I was what you would call “the self-proclaimed film critic” and the web is brimming with people like that. In May 2016, I watched and hated Rajeev Ravi’s crime thriller, Kammattipaadam, starring Dulquer Salmaan and Vinayakan. Everybody else seemed to love it. (I would later come to know that Baradwaj Rangan, our chief mentor for the 2017 edition of the lab, was one of this everybody.) And so started my quest to know more about cinema and do film criticism the right way. The problem was that I was very passive about it. So, when in June 2017, I found out that the Mumbai Academy of Moving Image (MAMI) was organizing an informal crash course on film writing and criticism, I didn’t think twice before applying myself. The Young Film Critics Lab required its applicants (aged between 18 and 25 years) to submit a short test, which I enthusiastically did. In the third week of July, I was confirmed as one of the students for the lab which would have its first round in August at J W Marriott, Juhu in Mumbai. The Young Critics Lab (sometimes abbreviated as YCL) was going to take me by surprise. I was one of the 60+ students who attended the first round of the workshop in August 2017. Before it even started, we were given a list of 50 essential films to watch. Films that Baradwaj Rangan, a National Film Award winner (for Best Film Critic; c. 2006), and a renowned critic currently with Film Companion, wanted us to see before we entered the hall that day. I had seen a mere eight films out of that list then and I am ashamed to say that the number has risen to nine as of today. Ironically or not, I watched Ridley Scott’s Blade Runner (1982) a few weeks ago, and let’s just say, I’m not a fan. I am not allowing you to judge my takeaways from the lab because there’s more to it than my relationship with this list. I had registered for the Young Critics Lab purely for the experience and to learn a few more things from reputed critics who have been in the know for years. In that way, the first day of the workshop was overwhelming. A review of a film is a write-up about what you feel about it, first-hand while and after watching it. It’s an opinion directed chiefly at the reader. Criticism, which is a subset/variation of a review, is describing why you feel what you feel. We also talked about filmmakers (Imtiaz Ali, Richard Linklater, and David Dhawan), film theory, basic-level cinema interpretation and analysis techniques, the process of reviewing and writing it, and the mythical concept of the perfect review. According to Baradwaj Rangan, the perfect film review – if it exists – is a mix of two approaches, reviewing and critiquing. How you differentiate between them is up to you and that will shape your reviews. The Young Critics Lab took us on a route to the history of film criticism. We discussed the personalities and works of writers and notable film critics such as Maxim Gorky, WG Faulkner, Otis Ferguson, James Agee, Pauline Kael, Andrew Sarris, Chidananda Dasgupta, and many others. Compared to the times when these greats were most active in, the landscape of cinema and film criticism has changed drastically. Because everyone is a critic today, film criticism has turned into a beginning of a never-ending conversation. With TV and web shows being consumed like water in the middle of a summer night across the globe, film criticism is no longer a concept that was considered niche between the 1940s and late twentieth century. So many films are released to the public that today it is up to you to choose what films you want to watch and review. A privilege that we both enjoy and are cursed with. Because there are so many films and shows and so little time. The most memorable takeaway from the first round was finding out the essential elements of a “good review”. Mastering some or all of these qualities can ensure that the review does not stray away from its main purpose: delivering an outlook or a perspective about the film to the reader. According to Rangan (with respect; apologies for calling him by his last name), everything from bibliographic information to spoiler-less plot description to the identification of theme/s to the overall feel of the film is important. We also had the lovely Smriti Kiran briefly talk about MAMI and the festival over the years. And that’s the photo below that we clicked to end round one a very high and eclectic note. Should a reviewer avoid reading other reviews? Is hating a classic film blasphemy? Should I base a review on first viewing only? Or can I watch it one (or a few) more time? Should I worry about hurting the cast and crew of a film while reviewing? Is film reviewing a sustainable profession? Is it okay to publish a review on a blog and a publication at the same time? How do I assign a rating? And what rating convention should I follow? If this is the type of questions you have about film criticism, you can be sure that the Young Critics Lab is made just for you. Here’s an active thread about it on Twitter. Watching a short clip of Satyajit Ray’s romantic drama Charulatha (1964) and reviewing it. There is relevance all over the place in this film, as is with any other Satyajit Ray film, but it’s the theme that makes Charulatha worthwhile and elevates the overall experience despite being a monochromatic film in a digital age known for its maelstrom of colors. It’s about a lonely wife who does not expect an acknowledgment of her situation, but instead a solution, which does not seem to show itself, not even in the politics that her husband brings into form. A fortnight later, I received a mail telling me that I had passed the first round. I was elated as I saw the qualification to both the second and third rounds as a sort of validation to my writing and perspective on films. The Young Critics Lab had already crossed its worth. Here’s a take on YCL by The Hindu. Most of the people I met who had traveled from afar stayed in local lodgings and hostels around the area (Juhu) to attend the workshop. This was both affordable and convenient because the festival also takes place in venues in a 30-kilometer radius from the usual venue (J W Marriott) of YCL. Venkat Ramanan (who is a video editor by profession), a friend from Chennai, stayed at the low-cost Urbanpod. He used to fly to Mumbai the night or two before the workshop, stay there for the weekend, and fly back the next week after exploring the city. He repeated this all the three months and I think he pre-planned this at work sometime in June/July. You may also get discounted rates on OYO rooms (partners of MAMI), so do check with the organizers before booking anything. So, if you are not in Mumbai, you are looking at staying in Mumbai for at least 5 days each for the first two months and then taking a longer break (of around 12 days) for the final month. Because you also have to mandatorily attend the festival and review all the films in a certain section (in 2017, it was India Gold) to be eligible for the Best Young Critic Award. I understand that the question of affordability arises for people who are not in Mumbai, but trust me, the Young Critics Lab is totally worth it if you really are an enthusiast. Plus, YCL finalists are given free passes for the entire festival. Which means they can catch all the screenings (4 per day, if they book online through BookMyShow) all the 7 days. You are anyway not gonna be working or studying when you are here, so why not make the most of it? I did not expect it but the two days of round two mostly entailed watching and discussing in vivid details two films – Rene Clément’s Purple Noon (Plein soleil) (1960) and its American remake, Anthony Minghella’s The Talented Mr. Ripley (1999). It was one of the most scintillating experiences for me, being in the midst of English Literature students and film enthusiasts who quoted Descartes and Homer and Oedipus while finding references in the films. A popular topic amongst debaters around the world, the workshop witnessed high-intensity comparison between the two films (each and everyone was going gaga for Alain Delon), with Rangan shooting points to discuss and us students breaking them into more points that even the two filmmakers would gasp at hearing. I think the 1960 French-Italian classic won the debate by a hairline margin but I think a majority of the folks present would agree that a tie would be the best way to end that debate. Once and forever. What I loved and would like to point out about these workshop rounds is that most of the discussions had natural humor in them. For instance, I remember a fellow attendee referring to a chef and his Italian pizza and comparing it with the anti-heroic character in the two films. It was a lively discussion which was elevated by an active participation by the students. Which is generally rare in such workshops. The 30 or something of us then proceeded to round three, which was scheduled on days adjacent to the start of the film festival. This way we could continue our discussions about films while experiencing the festival first-hand with newfound knowledge on film criticism. If there is one international magazine that I fervently follow then it is TIME. So when I received the mail about the third round informing me that TIME magazine critic Stephanie Zacharek would be mentoring us, I jumped up and down on my seat. I still remember going numb reading her reviews online and updating my watchlist on IMDb. Meeting her was not exactly a dream come true but heck! I thought it called for a selfie. A precious souvenir, a selfie with (l-r) Rangan, Anurag Kashyap, Zacharek, and me. Under Zacharek, we chiefly dug into international film criticism. Since Darren Aronofsky’s mother! (2017) had released in the US just then, 2 out of 4 topics that we discussed in round three included a reference to that. Which automatically made it a not-to-be-missed film at the festival for all the attendees. Reviewing films during a festival is probably the most challenging task for a film critic. You are looking at at least four films a day and you are supposed to write at least 1500 words of content per film and send them to the publishers because web publishing is nasty and time-sensitive. At the end of the first day, we watched a short clip from Jerry Lewis’s comedy, The Bellboy (1960). The task – which would partially help in adjudging the Young Best Critic – was to review that sequence and send it to Zacharek for review. The second day, we discussed some of the most interesting reviews. Mine did not make it, but it was exciting to see how others had perceived the scene (it was irritating). The workshop ended on a merrier note as I had made one friend (Ramanan) and raked in lots of great opinions and perspectives on cinema and its criticism. All finalists were handed a participation certificate as well as a coffee mug with the phrase ‘Where Literature Meets Cinema’ inscribed on it, probably describing what Mumbai Film Festival aspires to be or already is. Then we were given a bunch of guidelines as to what we were supposed to do during the week-long festival. Unfortunately, I had to cut short my experience on the second day of the festival due to an urgent surgery. I watched a couple films in the India Gold section and enjoyed the festival wholeheartedly while it lasted for me. Looking back, I would have done a couple things differently when the lab was in session. I would have also rescheduled my surgery, but for all that it’s worth, I had a hell of a time with everyone that I met and talked in the lab. And that definitely called for a photograph. To show to my grandchildren if they are ever born. In the above photo, that’s me (checkered green shirt) on the extreme left on the bottom row. Behind me in a red shirt is Yash, the Young Best Critic of 2017. Behind him, standing in a purple and blue checkered shirt is Venkat Ramanan, my friend from Chennai. I would be lying if I said all the three rounds were equally interesting and informative. Round one would take the pie for me as I learned a lot of things I didn’t know from Baradwaj Rangan. Watching the films and comparing them in the second round was exciting and a level-above experience. Stephanie Zacharek helped us see beyond India, as she also talked about film criticism as a profession in the West. But, out of everything, if I had to choose one great takeaway from the Young Critics Lab, then I would choose Rangan’s commandments on film writing and criticism. I believe every aspiring cinema writer should stand by these rules from day one. Only then can they make a difference. There are 20 commandments in total and it’s not easy. I would like to apologize to both Rangan and MAMI for publishing these without permission. That’s it about one of the most interesting and fruitful products by MAMI other than the festival itself and Movie Mela. I can confidently say that my knowledge of cinema and its criticism has improved considerably over the past year. I cannot say that I follow all of Rangan’s commandments, but I am on my way. I caught Blade Runner, didn’t I? And that definitely counts for #16. The Young Critics Lab will essentially give you some actionable tips and show you the direction. How you take it and what you make of it depends totally on you. I broke the mug last week but here are the certificates I got. I know I have talked a lot in this editorial and I’m not sure if I should have. But I had been meaning to do it ever since I prematurely ended my lab experience in 2017. Then when a guy named Cyril Samuel pinged me on Twitter to share my experience at Young Critics Lab, I just had to do it. I hope he makes it to the lab next year. If he does then I think my job is done here. TN. This entry was posted in Editorials and tagged film criticism, mami, mumbai film festival, young critics lab. Bookmark the permalink. Post a comment or leave a trackback: Trackback URL.